A British charity helping whistleblowers around the world on Thursday launched a legal aid fund for WikiLeaks founder Julian Assange, warning his expulsion from Ecuador's embassy in London "may be imminent". 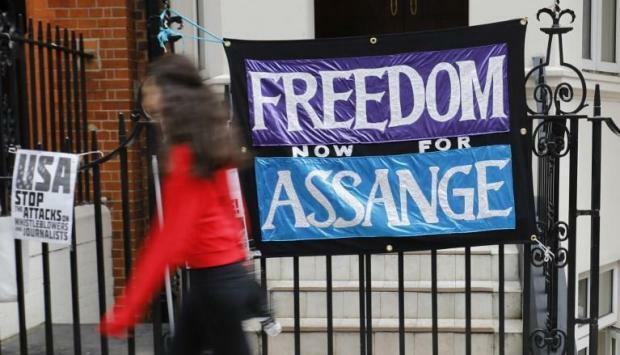 The Courage Foundation said Assange's position in the embassy, where he has been living since seeking refuge there in 2012, was "under increasingly serious threat". Ecuador's President Lenin Moreno last month said that "the way has been cleared for Mr Assange to take the decision to leave in near-liberty". Moreno said Britain had guaranteed that the 47-year-old Australian would not be extradited to any country where his life would be in danger. Ecuador has been seeking a way to terminate Assange's stay for several months, amid souring relations with its embassy guest, who recently sued Quito for restricting his internet access. Assange, who gained international renown by publishing huge caches of hacked State Department and Pentagon files, has repeatedly expressed fear that Britain would extradite him to the United States to face charges there. The 251,000 classified cables from US embassies around the world -- released by WikiLeaks in 2010 and published by leading international newspapers -- embarrassed the Bush administration in Washington and caused ructions in its bilateral relations with other countries. In Britain, he faces prosecution for failing to meet his bail conditions after fleeing to the embassy to escape extradition to Sweden on sexual assault accusations that have since expired. "Prosecuting Assange for publishing constitutes a major attack on press freedoms at large, and his trans-Atlantic legal defence will require contributions from supporters around the world," the foundation said. The group said donations would "go solely to support the campaign to defend WikiLeaks' staff". US prosecutors in November inadvertently revealed the existence of a sealed indictment against Assange, according to WikiLeaks, but it was not known what the actual charges were. The possible indictment suggested that Washington will seek Assange's extradition if he leaves the embassy. There is speculation that the US interest in Assange is connected to the investigation by Special Counsel Robert Mueller into Russian interference in the 2016 election that brought President Donald Trump to office.